There are a lot of great reasons to include beans and lentils in your diet. They’re a low-fat source of protein, for one, and chock full of fiber. But a new study shows that eating more pulses (the ripe seeds of a wide range of pod-bearing, leguminous plants) could be a simple way to improve your cholesterol. Just one serving a day—three-quarters of a cup—of beans, peas, chickpeas or lentils could cut LDL, or “bad,” cholesterol, researchers from St. Michael’s Hospital in Canada found, reducing the risk of cardiovascular disease. Lead researcher Dr. John Sievenpiper found that including a single serving of pulses in your diet each day could cut LDL cholesterol by five percent, which could correspond to a five- to six-percent drop in the risk of cardiovascular disease. The researchers’ analysis didn’t prove a direct link between the daily serving and reduced cholesterol, but the results did show a strong association. Encouraging! Low-density lipoprotein (LDL) cholesterol is the type you want to keep low, according to the American Heart Association. LDL cholesterol can accumulate in the arteries to form plaque, leading to artery narrowing and hardening called atherosclerosis. This condition contributes to the risk of a heart attack or stroke. Sievenpiper and his team did a meta-analysis of 26 randomized controlled trials involving a combined 1,037 subjects followed for at least three weeks. They found that men who included a serving of beans, peas, chickpeas, or lentils in their daily diets experienced a greater reduction in LDL cholesterol than women because their diets were initially poorer and their cholesterol was higher, so they had more room for improvement from the change. That means that this study, published in the Canadian Medical Association Journal, could make a difference in the lives of many North Americans. Heart disease is the leading cause of death in both the United States and Canada. One serving of beans, peas, chickpeas, or lentils is 130 grams or three-quarters of a cup—not a huge amount and one that’s easy to incorporate into your diet by including pulses in other foods you already eat, like soups or salads. If we’re just talking about one serving a day, shouldn’t that be an easy target to reach? It is—but the average North American currently gets far less than that amount of beans and lentils in her diet. For added incentive, beans and lentils aren’t just a boost for heart health. Legumes have both soluble and insoluble fiber, according to the Grains and Legumes Nutrition Council, and are a source of essential B vitamins and phytonutrients. 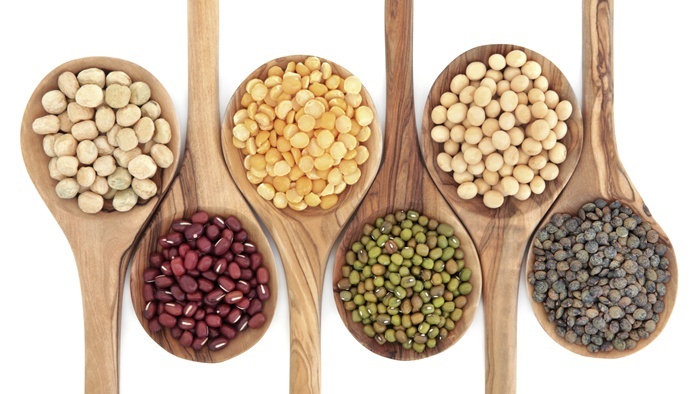 Pulses have a low glycemic index, so they don’t cause sudden spikes in your blood sugar. And when used to replace animal proteins, they can cut the calories and fats in your diet, particularly saturated fat, trans fat and cholesterol. One caveat: Some of the study participants reported experiencing gas, bloating, diarrhea or constipation when they upped their consumption of pulses. Drastically increasing your fiber can lead to similar symptoms as your body adjusts, but they will fade with time—and indeed, the participants who had tummy trouble saw these discomforts subside. You can reduce or eliminate these problems by increasing your fiber consumption gradually. So now you’re good to go! St. Michael’s Hospital, “Daily serving of beans, peas, chickpeas or lentils can significantly reduce bad cholesterol,” ScienceDaily;​ www.sciencedaily.com/releases/2014/04/140407122749.htm (accessed May 30, 2014). Robert Graham, M.D, internist specializing in Integrative Medicine, Lenox Hill Hospital, New York City; Dana Angelo White, MS RD, sports dietitian and assistant clinical professor, Quinnipiac University, Hamden, Conn; CMAJ, the Canadian Medical Association Journal, news release April 7, 2014.